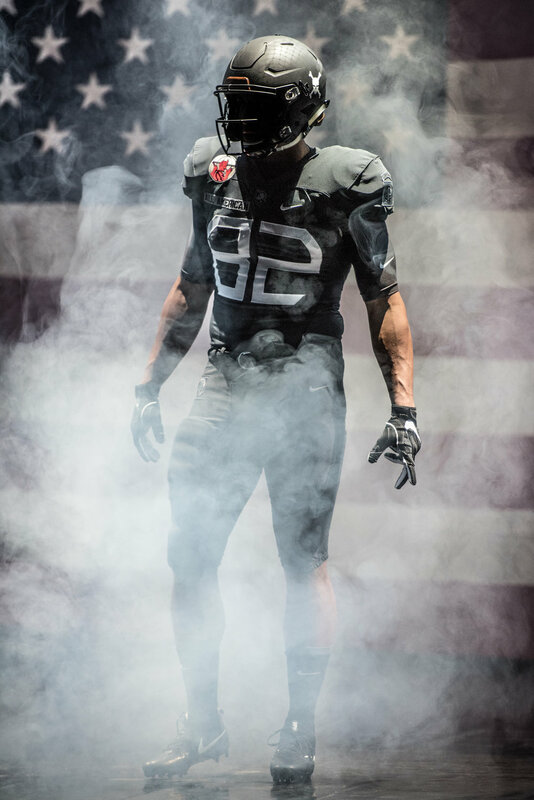 Army West Point Football and official apparel sponsor Nike unveil the 2016 Army-Navy Game uniform. 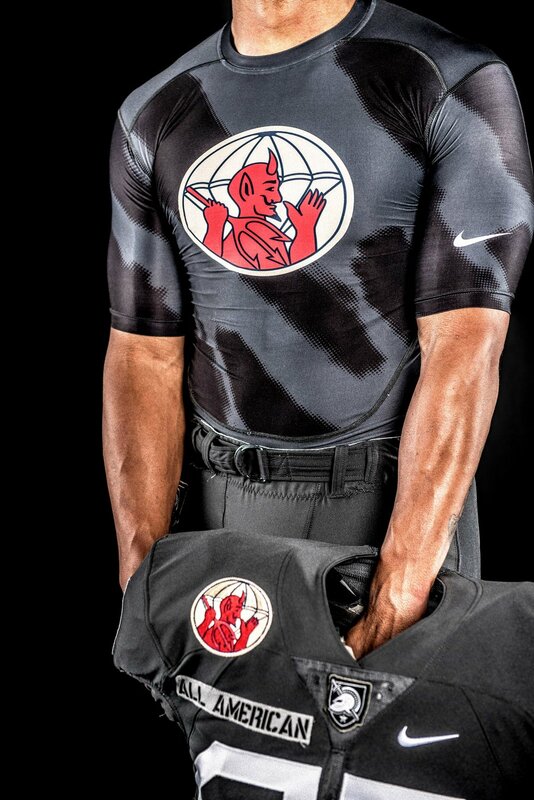 This uniform was inspired by the World War II paratroopers of the 82nd Airborne Division. We honor the past by re-telling stories of valor, courage, and sacrifice. Inspired, humbled, and motivated by the soldiers that came before us, we don their patches, adopt their mottos, and hold their deeds close to our hearts. Highly trained and highly disciplined, the soldiers of the 82nd Airborne were asked to spearhead the invasions of Italy, Normandy, and Holland. With little to no reinforcements or relief in the most adverse conditions, their physical and mental toughness was pushed to the limits. Their unwavering brotherhood and intense dedication to success, ultimately led to mission accomplishment. Received the nickname of the 'All-Americans' during World War I due to drawing members from every state. As an airborne division during World War II, the 82nd drew some of the best men, whether they enlisted or were drafted into the Army, to volunteer for the hazardous duty of parachuting or riding a glider into combat. The black and muted gray tones express the fact that some of the most treacherous combat jumps happened at night, under the cover of darkness. 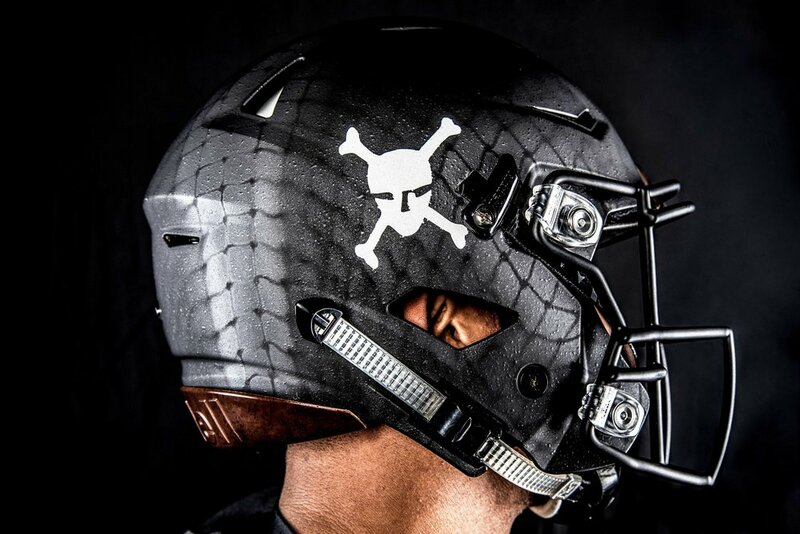 The helmet design highlights the netting and hand-painted camouflage shapes that help disrupt the form, along with showcasing an array of authentic, era-specific tactical symbols. 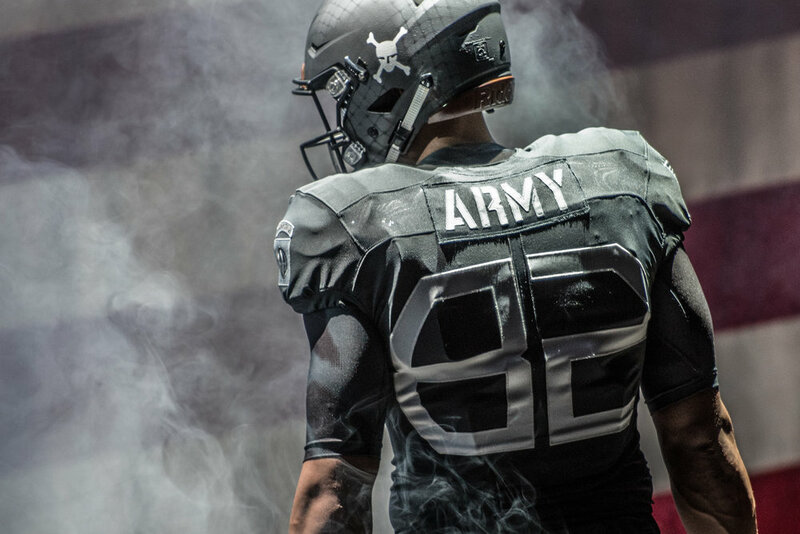 Army West Point branding completes the Long Gray Line that connects the current Corps of Cadets to their brothers in arms. 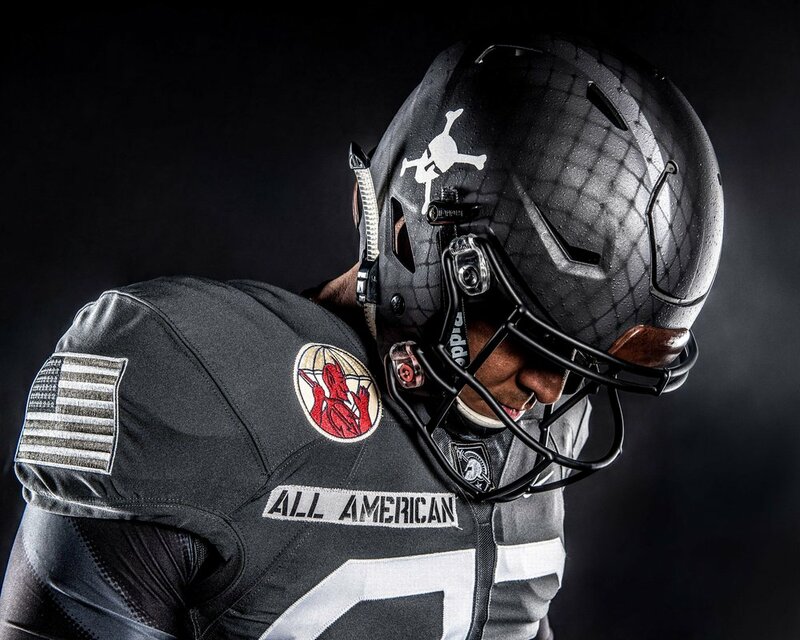 The uniform design pays homage to authentic WWII era paratrooper jump suits with division patch, oversized 48-star American flag patch, player name tapes, full-color historical unit patches and an improvised camo base layer. Additionally, initial members of the 82nd Airborne Division came from all 48 states which informed their “All American" nickname and iconic “AA” shoulder patch. The flag is modeled for the era of the men of the 82nd in combat during World War II. During the invasion of North Africa in 1942, U.S. forces wore the American flag on their left shoulders with the blue field forward to identify themselves to the Vichy French as Americans. By the end of North Africa and before Sicily, units began wearing divisional insignia on their left shoulders. This necessitated moving the American flag to the right shoulder, however the design was not changed. In lieu of Distinctive Unit Insignia during World War II, each regiment designed and wore large patches on the right breast of their jump jackets or other jackets while in garrison. These patches not only identified the regiment or battalion a trooper belonged to, but became immense sources of pride within the sub-units of the 82nd Airborne. Nicknamed the 'Devils in Baggy Pants' based on the captured diary of a German soldier, the 504th participated in the invasions of Sicily, Salerno, Anzio, and Holland. Jumping Jim Gavin's 505th participated in parachute assaults of Sicily, Salerno, Normandy, and Holland during World War II. The nickname 'H-Minus' demonstrated the regiment's mission to arrive on the battlefield before the schedule time of a seaborne invasion, commonly called 'H-Hour'. 'Raff's Ruffians' named after their last commander Edson Raff, participated in the Normandy landings with the 82nd. Afterwards, it was reassigned to the 17th Airborne Division, where the regiment conducted a parachute assault across the Rhine River on 24 March 1945. The regiment known as 'El Diablo', with the appropriate motto 'Fury from the Sky' the 508th participated in combat jumps in Normandy and Holland. The 82nd's only glider infantry regiment. With its motto 'Let's Go!' the regiment participated in operations on Sicily, in Italy, France, Holland, and Belgium. Carrying its motto of "I maintain the right" from World War I, the 307th AEB was the divisions engineer battalion for the entire war, and fighting everywhere the 82nd was ordered. After being assigned to Darby's Rangers during the Sicily and Salerno campaigns, the 319th participated in the Normandy and Holland invasions with the 82nd, with whom the 319th remained attached to for the rest of the war. Remaining in reserve during Sicily, the 320th GFAB made up for lost time, participating in operations in Italy, Normandy, Holland, and Belgium, before accompanying the division into Germany. By dropping their cannon on Sicily, the 376th PFAB became the first unit to drop field artillery via parachute. The battalion's motto 'Look out below' was appropriate as it jumped cannon in support of the invasions of Sicily and Holland. The 456th PFAB offered parachute-borne artillery support to the 505th PIR during the invasion of Sicily. Afterwards, the battalion was detached and remained in Italy supporting the 1st Special Service Force in the campaigns for Cassino, Anzio, and Rome. The battalion was later redesignated the 463rd PFAB. "American parachutists -- Devils in Baggy Pants -- are less than 100 meters from my outpost line. I can't sleep at night; they pop up from nowhere and we never know when or how they will strike next. Seems like the black-hearted devils are everywhere......" - Translated from the diary of a German Officer KILLED AT ANZIO. A major challenge in airborne operations is to consolidate forces. This becomes even more difficult at night. To alleviate this, certain units of the 82nd began painting tactical symbols on the sides of their helmet in order to aid identification during the Sicily operation. This practice spread to other sub-units of the Division as the war progressed. "Every mission accomplished. No ground gained was ever relinquished" - MG Matthew ridgway ('17), former army football manager and commanding general of the 82nd. 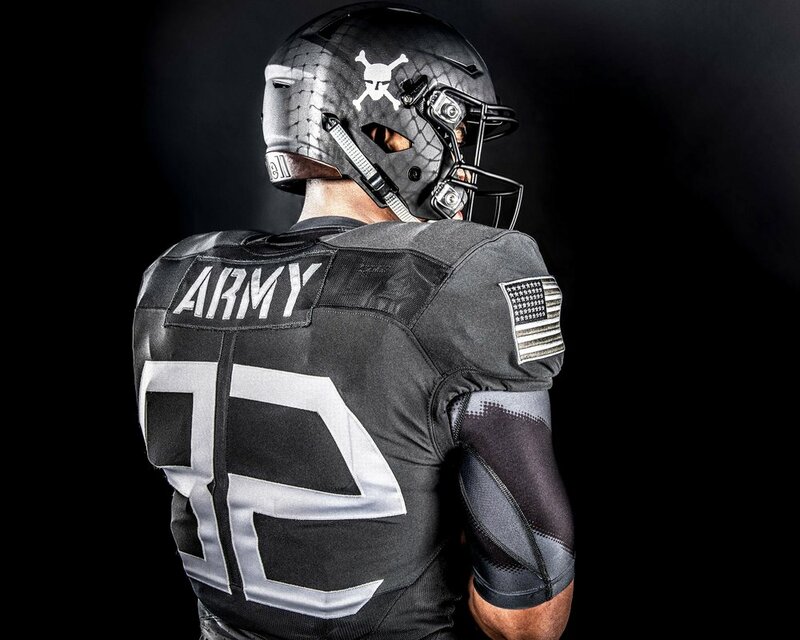 Do you have an idea for a future Army-Navy uniform concept? Tell us what you think.